Technological changes are a continuously evolving process which keeps every business on their toes, and one such revolution has been the introduction of “cloud” in the communication sector. Prior to the cloud, every business had to maintain a separate IT personnel to handle the array of wires and hardware in order to ensure a smooth communication — in and outside the organisation. As technological changes started capping the industry, these wires, hardware, and software became obsolete. With the cloud, a business becomes independent from the installation, IT personnel or system maintenance cost. The service provider now handles all the setup, maintenance and upgrade of the telephony infrastructure on the cloud. As consumers of these services, business only needs an interface to connect with the telephony server to get started. Cloud telephony is the technology where communication devices are hosted over service provider’s premises and are made accessible to the customers through the cloud. Further, a web interface is provided to the customers to connect with this cloud-hosted system. In the past, when the businesses planned to scale or migrate their office space, then concerns like the cost of buying a new telephone line or time delay in the infrastructural setup would start to surface their mind — making the whole migration process a cumbersome task. But, with cloud telephony, businesses simply need to inform their service providers of any such change, and the rest is then taken care of automatically. Most companies save around 15-30% on operational expenses. The need for resources is lowered as the whole set up is virtualised which directly affects the overall spending of the enterprise. The pay-per-use model makes it more affordable for the small and medium enterprise businesses to adapt. Multiple servers are kept in data centres to handle any unexpected technical failure. If one system fails, another set of the system automatically takes its place to starts the services with no time lag. Shape of no business remains constant – every business is bound to grow or shrink. To keep up with the ever-changing need, cloud telephony services comes very handily. Any no. of users/channels can be added or removed from the server as per the requirement. Software industry keeps expanding and adding new features. To sync your communication system with these changes, service providers keep updating the software and hardware at the backend without affecting the user’s usage. Keeping your services updated without investing any extra effort or time is the major benefit of cloud telephony. Cloud telephony functioning is no different from the traditional way, the major distinguishing factor between the two is – former is located on the premise of the customer/business itself and latter is installed over service provider’s premises which is accessible through the cloud network. When a customer dials the call — it is first redirected to Hosted Public Branch Exchange(PBX) on the cloud. 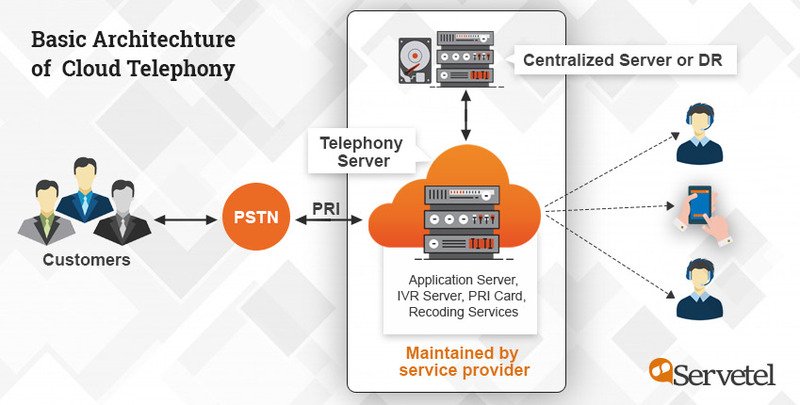 This transfer of data is made through a Primary Rate Interface (PRI) line which is connected to the telephony server with a PRI card (PRI line is a telecommunication standard used on an ISDN to carry voice, video, data, and other network services between the user and the network). 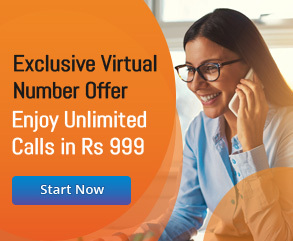 This hosted PBX (which is provided by the service provider) stores the necessary phone numbers and information to decide routing structure for every call. All your office phone extension is connected to the hosted PBX, so every phone call landing on PBX decides it’s best suitable agent after browsing through these the set priorities in the system. PBX can even block certain calls — if the service provider or customer explicitly sets it in the rules. Once the server decides the best-suited agent for the request, it immediately connects the customer and the agent over the phone line. Call transfer between the agents is comparatively a faster process as all the agents are connected to the same umbrella of hosted PBX. Why Should Business Go For Cloud Telephony? Voicemail is a method of storing voice messages electronically. This feature is particularly beneficial in the cases where all the agents are busy on other line or are unavailable due to other reasons. The message is stored as a voice recording on the local storage — which is later retrieved by the agents and responded. This feature allows the business owner or agents to remain available for the calls— in case they are not physically present in the office. 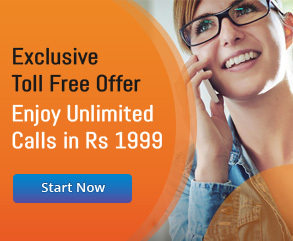 You can utilise the cloud services to forward the incoming calls to your number. Store a list of forwarding numbers in the system to automatically forward your calls to those numbers according to the set priority. The caller remains untouched by the whole forwarding process. Interactive Voice Response (IVR), is a smart feature which helps the business to automatically attend/answer the call with a recorded greeting message. The automatic attendant replaces the manual task of attending and transferring the calls. This feature saves a lot of human costs which used to be spent on hiring a dedicated resource to attend the incoming calls. Once the business is set up, the next step lies in the maintenance which can only be achieved by constantly monitoring your processes. Call recording is one such facility which allows business to record every incoming and outgoing call depending upon the business requirement. This feature helps both the customers and the business in maintaining the authenticity of the conversation and the business processes. To utilise all the above features, an interface is provided by the cloud service provider. To expand the usage and flexibility of use, this interface is easily accessible through the desktop and web platforms. Many service providers have now developed apps for easy accessibility of services for the agents. With the mobile apps, agents/admins can at any time access and monitor their calls on their fingertips. There are many cloud telephony software’s which adds value to cloud telephony processes by providing the integration flexibility. You can integrate your CRM, industry-specific management system or other software’s into your cloud telephony systems to maximise your usage. So, as the number suggests, there is no denying to the fact cloud is the new revolution in the market. And customers are welcoming this revolution with open mind and arms. So, it’s high time to adopt cloud telephony into your business to amplify your customer experience and profits.